Following on from the last post about sustainability, this time we’re going to focus on Passivhaus. Some people love them, some people hate them, but there’s no doubt that they deliver huge environmental benefits. Passivhaus homes are designed to maintain internal temperatures within a comfortable temperature and humidity range throughout the year, with only a small amount of space heating needed. Insulation, triple glazed windows and air-tightness keep heat in or out. A Mechanical Ventilation with Heat Recovery system keeps air clean and contrary to popular belief, windows can be opened! The Green Building Store have answers to some popular questions about MVHR. 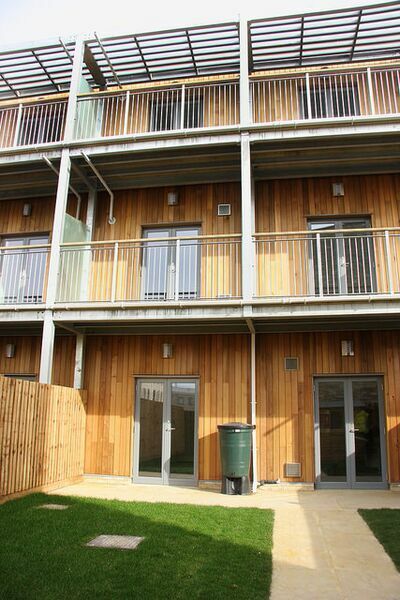 “Before granting planning permission, Leicester City Council made Passivhaus certification an essential requirement for all 68 homes on the Saffron Acres development. The different orientations of the plots made this an even greater challenge because it meant that a variety of fabric specifications would have to be used for insulation. All 68 plots achieved Passivhaus certification, making Saffron Acres the largest Passivhaus residential development in the UK”. Food for thought when planning a CoHousing development?